Erected in 1851 and sitting a top a 150 foot cliff stands the Monhegan Island Light. The mile and half island is located some 12 miles off the coast of Maine and is home to a maritime community that is mostly made up of Lobstermen and fishermen. The island's history dates back to before the pilgrims landed on Plymouth Rock. 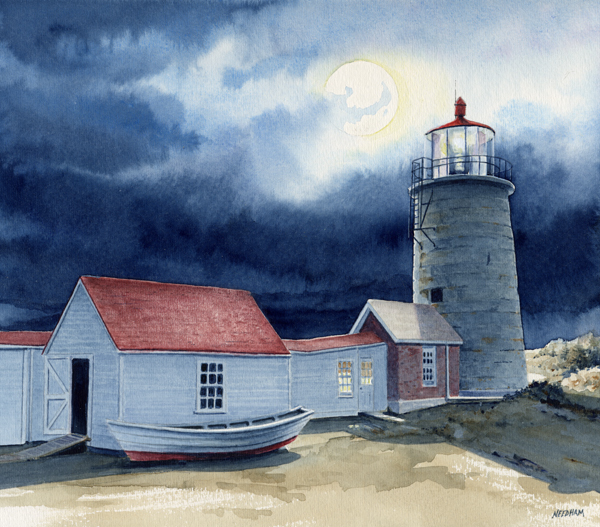 The Monhegan Island's near solid granite light tower stands 47 feet tall and emits a stream of light 180 feet above the waves that can be seen 20 miles away. In 1959 the United States Coast Guard automated the light. Today the Monhegan Station and the light's modern optics are powered by a compact electric generator. Monhegan Associates acquired the keeper's dwelling and ancillary structures at the station and turned them into a museum devoted to the history of the island. To get to the island take a ferry out of Port Clyde.